Hello friends, I just wanted to let you know that I made it through my foot surgery with no problems, I’m so very thankful. My sweet mother is here waiting on me hand and foot – another thing I’m extremely grateful for. I certainly didn’t want to miss Day of Friday Giving so I have a card to share – one of my favorites. This one features a tiny tag to personalize the card – that way I could have a whole card front that I didn’t obsure with a panel and a sentiment. 1. The card base is 5-1/2 x 7-1/2. 2. On top of the base I added a layer created by washing with pink watercolor, on watercolor paper and stamping with a script stamp. 3. On top of the watercolor wash layer I added Spellbinders Butterflies that I also washed with watercolor. 4. The dimension is added by cutting an additional Spellbinders Butterflies layer (spray with spray adhesive, sprinkle glitter and add pearls). Then snip each butterfly to free it, fold in half and adhere on top of each existing butterfly with a drop from your mini glue gun. 5. 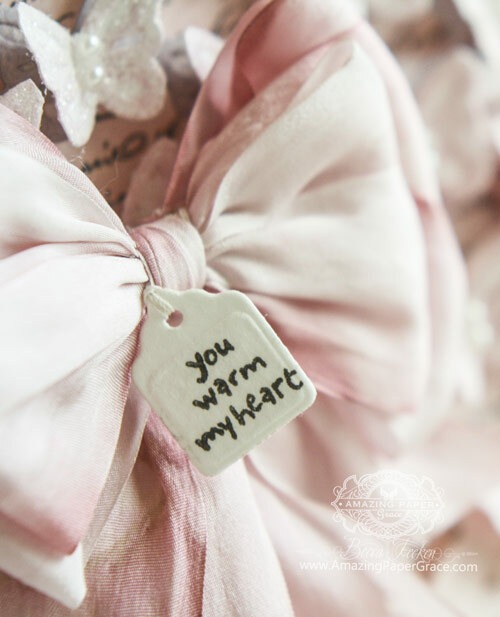 Add ribbon, bow any tiny tag to personalize. The good news is that I am caught up and have sent out every card I have an address for!! Every Friday it’s my pleasure to give away a card. The card goes to a randomly picked reader (worldwide) who leaves a comment in our conversation. Want to know more about Day of Giving, here’s a link to my FAQ’s just check out #11. You can check to see if your name is on the list of winners HERE. For your comment today: Flowers are such a sweet, positive thing – what’s your favorite flower? Accessories: Spellbinders Butterflies, Assorted Ranger Reinkers, Ranger Glitter, The Paper Studio Pearls, May Arts Silk Ribbon Sweet friends have a lovely weekend. Please know I’ll be praying for our foreign friends that have endured such a wicked tragedy. Good will prevail. Beautiful card Becca!!!! My favorite flower is the orchid…..they come in every color you can think of and last such a long time, I always try to have one on my kitchen counter! Beautiful card Becca! Hope you take it easy as you recover and try to enjoy relaxing and being taken care of. Love this card! The color is gorgeous, too. I’m going to have to bring it up again on my laptop to see the detail better as my phone isn’t letting me enlarge the picture. I am so in love with these butterflies! I have always loved the bows. Noone makes bows as great as you, Becca! My favorite flower is the Lilac. But I have a close 2nd and that is Carnations. My favorite flower is the iris – so stately and yet so delicate – and so many of them have that innate sparkle to them. I just adore them – such a sweet, and subtle fragrance as well. I have a couple varieties that are re-bloomers, too. So delightful! Beautiful Card Becca. Glad to hear your foot surgery went well, but I hope you are taking it easy so the recovery will go as well. You are so lucky to have such a great Mom. Beautiful card to remind us of all the beauty in the world. Yes, good will prevail! So glad your surgery went well and you have your mom there to take care of you! I’m thankful your surgery went well, Becca. I hope your recovery continues to go smoothly. This is such a sweet card – I’ll bet it really shimmers in real life. Glad your surgery went well. How blessed you are to be able to have your Mom be able to help you out! Get back on your feet soon. Love your gorgeous butterfly card! Just wow. That card is so delicate and pretty! What a beautiful card Becca. Glad to hear your surgery has gone well, and what a blessing to have your mother with you!! My favourite flower is the humble freesia. So pleased that the operation went well and that you are recovering with your Mum there to help. Hope you have some wonderful ‘together’ time and that you are soon up and running around again. Such a cut card! Love the butterflies and that bow! I like many flowers, but my favorite is the sunflower. It’s big, bright and reminds me of the sun. Sunflowers inspire feelings of happiness and joy when I see them. Glad your surgery went well, and that your dear Mom is there to help. Beautiful card, as always. Your work is so gorgeous and your blog is quite inspiring. Cute card Becca and sending healing wishes as you recovery from your surgery. So happy to hear it went well. SO PRETTY & WHAT A GORGEOUS BOW, Becca!!!! Glad your operation went well & a plus with your mom with you. Becca, I’m so relieved that your foot surgery went well. Your card is gorgeous as usual and that little tag is so cute!! You make the most beautiful bows I’ve ever seen. I would have to say my favorite flower is the rose…especially a true antique rose. They are not only beautiful, their fragrance is so heavenly that it’s intoxicating. Hydrangeas almost tie for my favorite because I love the soft pastel feminine colors. So glad ur doing well with surgery. Love the butterflies!! That is a great way to have a card for everything!! Well almost !! I love all flowers because friends are flowers that never fade!! I was always partial to snapdragons when I had my house and little flower bed. Hi Becca glad to hear your surgery whent well ! One ….. of my favourite flowers is Lilly of the valley so retro lol. So glad you are on the mend and receiving such loving care. It’s so like you to being thinking of others as you heal. I am so grateful for your generosity! I love roses. While I appreciate many flowers, roses are my favorite. They happen to be the flower for my birth month – June. I never tire of their artistic and graceful beauty. I hope some flowers are smiling on you, dear one. Pink, roses and butterflies. My perfect combination. Wonderful! So glad your surgery went well. Sending prayers for a speedy recovery. I am happy you are feeling well after surgery. Good morning Becca, what a beautiful card !!! Glad your surgery went well and you’ve got your mum to look after you!!! My favourite flower? now let me see! I think it has to be all of them I couldn’t pick there are so many beautiful flowers all of the ones mentioned but what about Freishas Magnolias Daliahs Lilly’s and all the wild flowers just too many to choose!!! Such a sweet card, love what you have done to make the butterflies “fly”. Hi Becca, Sooo glad to hear, that your surgery went well and you´re fast on recovery, and that you´re able to have your mum with you too is great. And yes we´re all sooo sad about what happened in France the other day and now also in Turkey yesterday, it´s really a tragedy and really scary, as it gets sooo close here now, so that probably makles one think even more about it. My favorit flower is many, but on the top list is the Freesia, the Rose and the Lilly of the valley. I just love these flowers a lot, but I must admit, I love mmost flowers and enjoy most of them in my big garden every year. I love this card. It’s so pretty. I’m glad you’re doing well after your surgery. Hi Becca, Brilliant news that your foot surgery is over and your Mom is looking after you, I’m sending huge hugs for a speedy recovery. 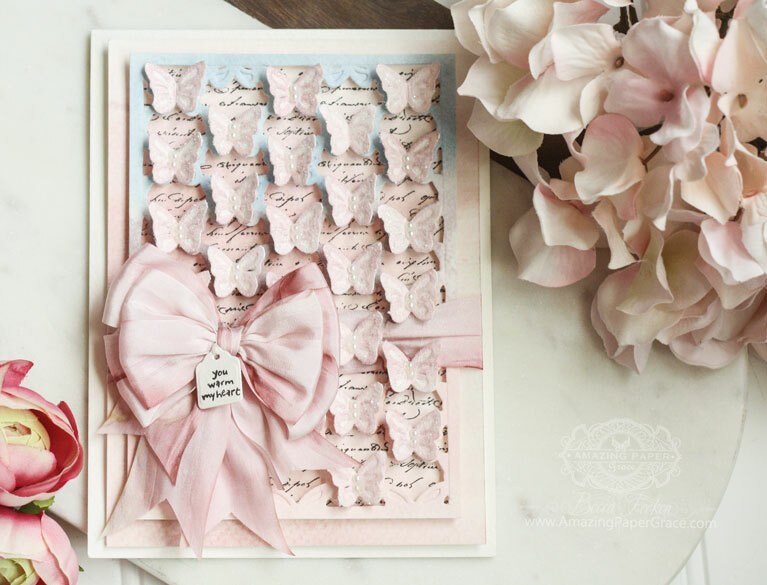 A plethora of butterflies and a fabulous bow, completes this gorgeous card. Poppies are my favourite flowers, just a shame that I can’t seem to grow them in my garden haha. A beautiful card in my favorite color! It makes me smile with all the pretty butterflies! My favorite flower is the daisy. They are so fresh and feel like a very happy flower to me. So glad your surgery wen well and that your mother is there with you i wish you a speedy recovery. Akk….I’ve been away with computer problems and just see you’ve had surgery… SO SORRY! Glad to hear you’re home recuperating… wishing you a speedy recovery! This card is so lovely!! It reminds me of walking in literal clouds of butterflies at Igauzu Falls… an amazing experience! WOW! Stunning card, so beautiful. I hope you are feeling a little better after your foot surgery and are doing as your Mom tells you lol! Rest it well and I am sure you will be back on your feet in no time. DAISIES!!! I will take a daisy over a rose any day. Their simplicity moves me in a way no other flower does. It’s the simple things in life that make me happy! Boy am I late, thought I had commented and then found out guess it didn’t go through. Becca, your bow is fabulous. Have got to start making more again as I have your gavulous bowmaker. My favorite flower is the hibiscus! So tropical, reminds me of Hawaii, even though I have never been there. So glad your surgery went well and Momma is there helping and you are able to keep creating!!! God Bless! Hi Becca, Sweet, sweet, sweet tedium. Love the butterflies and torn paper. My favorite flower has to be a yellow rose, which represents the State in which I grew up. Texas! And I miss it every day as that is where my family is. So glad your surgery went well. You are very blessed to have your mother there to take care of you. Hope you tell her how special & beautiful she is to take care of you. My favorite flowers are carnations & Dahlias. My grandmother grew the most beautiful large Dahlias in her flower garden & they always remind me of her.